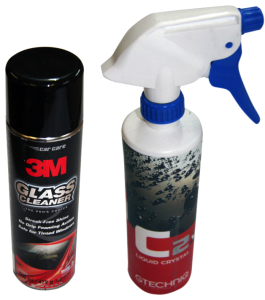 These great cleaners work really well with our finished paint protection film (the hand spray bottle) or window tinting film installation (the 3M spray). Much like when you buy a pair of shoes or trainers, you get offered a cleaner or protection substance for the shoes, these are good things to offer a customer after installation. The sprays are more than just a polish. They leave a water resistant finish to the surface of the film and makes polishing etc. easier. The 3M spray is designed specifically for tints and is completely scratch and smear free. Why not up-sell these products as an extra after an installation job; or even offer them for free (!) – you’re guaranteed to have a happy client.